Kinlochleven lies at the eastern end of the beautiful sea loch, Loch Leven, seven miles east of Glencoe. The village's fortunes have fluctuated over the years, and it would be fair to say it saw in the third millennium "between booms". At the start of the 1900s the end of Loch Leven was marked by a pair of tiny settlement, Kinlochbeg and Kinlochmore, either side of the River Leven as it approached the loch. Access was primarily along the old military roads now used by the West Highland Way, south to Glen Coe or north to Glen Nevis. This all changed with the coming of the British Aluminium Company in 1904. It built the eight mile long Blackwater Reservoir high on Rannoch Moor to the east, then the largest reservoir in Europe. 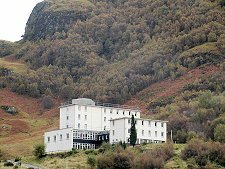 And it used the power generated to smelt aluminium in the vastly expanded company village of Kinlochleven. Sadly, the site stopped smelting in June 2000. Access remained primarily by sea until the current roads along Loch Leven were built by prisoners of war during World War One. The next sixty years saw the village's fortunes riding high. The smelting works provided employment, and the roads provided through traffic as drivers sought to find an alternative to the frequent queues for the ferry across Loch Leven at Ballachulish. 1975 saw the opening of the Ballachulish Bridge, and with it the cessation of the traffic through Kinlochleven avoiding the ferry queues. 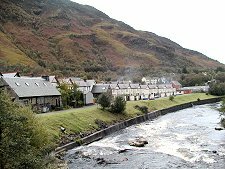 On the other hand, the ever growing popularity of the West Highland Way brings a steady stream of footweary visitors to the village looking for sustenance and their final night's accommodation before Fort William. 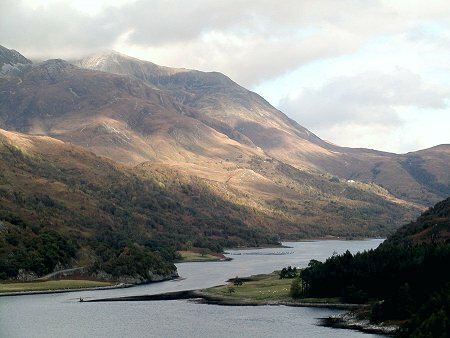 This may well show the way ahead for Kinlochleven, because its location is truly superb. Loch Leven is one of the most attractive lochs in Scotland. And the village is surrounded by imposing mountains. To the north lie the Mamores, while to the south are the mountains guarding the north side of Glen Coe. 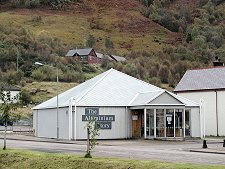 As a result, an ambitious redevelopment of the village is under way as part of Lochaber's claim to be The Outdoor Capital of the UK. This will bring new life and new business to the village, and build on its natural assets as a centre for outdoor tourism and mountain sports. And signs of this new life are already appearing. 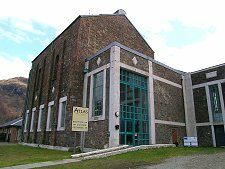 The Atlas Brewery has moved into part of the old aluminium works and is gaining a reputation for good beers. 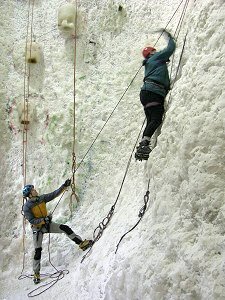 And next door to it, and even more ambitious development has produced The Ice Factor, which includes the world's biggest indoor ice climbing facility, the UK's largest articulated rock climbing wall and a wide wide range of other facilities.